Big bombshell out of Stillwater on Wednesday. 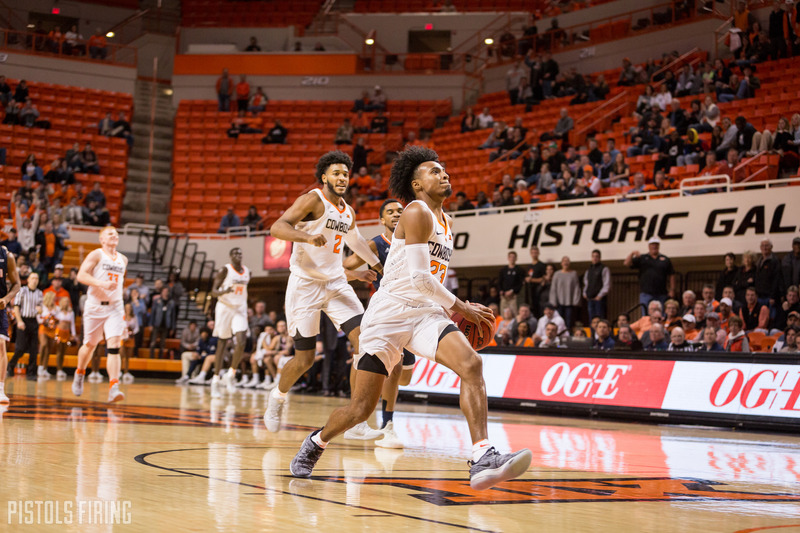 Michael Weathers, Kentrevious Jones and Maurice Calloo are no longer part of the Oklahoma State basketball program due to a violation of team rules, OSU announced on Wednesday. Weathers, a transfer from Miami (Ohio), was averaging 9.2 points and 2.1 assists per game for OSU this season. Calloo was averaging 2.5 points and 10.7 minutes per game. Jones, meanwhile, was in the midst of serving a second suspension this season. Boynton said his status was up in the air earlier this week. Jones and Calloo are both true freshmen. Weathers had been in trouble earlier this season after allegedly stealing a wallet with contents, and faced felony grand larceny charges at the time. He worked his way out of the dog house recently, but sources tell PFB a more recent incident involving Weathers and the two newbies was the final straw for the talented trio. The development is a blow to a team that had already been thin on depth. Just last week, graduate transfer Mike Cunningham and OSU parted ways mutually. OSU now has only nine players in total on its roster for the rest of the season and seven scholarship players (eight counting Trey Reeves, who is on scholarship for the remainder of the season).